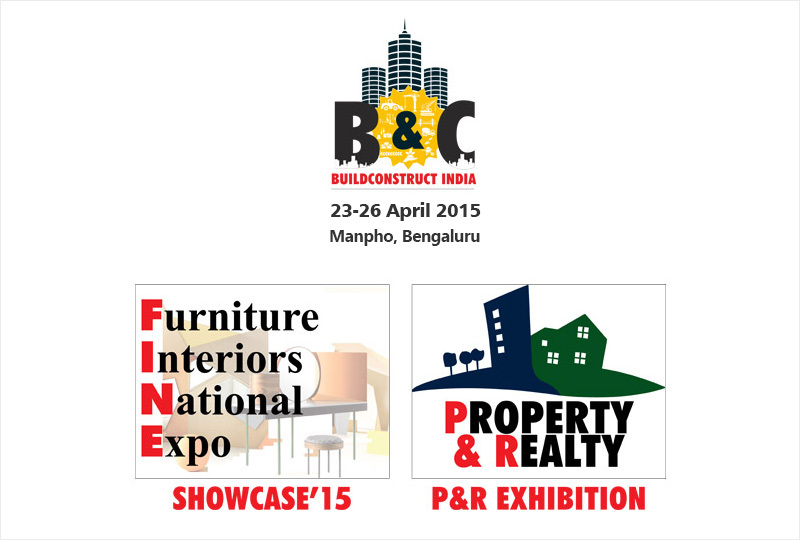 Bengaluru is set to host one of the largest construction, interiors and property exhibition-Buildconstruct India from the 23rd to 26th of April 2015 to be held at Manpho Convention Centre. It is one of the largest Construction and property development expo conducted in India with venues in Goa, Pune, Nagpur and Mumbai. With over 15000+ B2B concerns exhibiting their products and services in an environment conducive to business promotion and growth, Buildconstruct India is the place to be if you are looking to sell or purchase in this field. BuildConstruct India is an all in one construction, interiors and property exhibition that gives you a fantastic opportunity to meet your industry peers and promote your business. It is a purely B2B oriented exhibition that offers unmatched abilities to showcase your business and reach players in an easy and relaxed business environment. All visitors to this event arrive with the intent to interact and purchase. It provides you with the opportunity to conduct live demos of your product and generate sales ready leads and convert them to sales immediately! You can exhibit your products under specialized themes and showcase your strong points to buyers from specific industries. Target audience is high quality and filtered to ensure that all interactions are of value and generate interest. Buildconstruct India is a pure trade and bulk purchase only event which means that your target audience is there specifically to purchase and/or place orders. This enables you to enhance your chances of generating revenue. With various MNCs planning to participate in Buildconstruct India, you can educate yourself about international standards and see products that may be difficult to come by in everyday circumstances. If you are planning to present at Buildconstruct India, know about perks that we will be providing you before and during the event. Understand the various reasons why you should not miss visiting this mega event. Be it as a participant or just a visitor, BuildConstruct India is the perfect place to be seen and heard. The detailed brochure of the event includes all the information that you may need to know to make an informed decision. BuildConstruct India is brought to you by Strategic Trinity Events, an event planning and promotion service provider with over 13 years of experience in the field. Trinity Ventures is an ISO 9001: 2008 company, recognized by the American National Standards Institute (ANSI), through International Conformance Veritas for organizing trade and business exhibitions, event management, media and publications". Incorporated in 1994, it has over the last 19 years emerged as India's premium producers of international B2B exhibitions and specialized events. Every Trinity world event addresses the needs of both foreign and Indian businesses, opening many avenues to the multi-crore indigenous market.